Retains the older 1.8-litre petrol engine and gets a new 1.6-litre diesel unit. Gets a 7-inch all-digital instrument cluster with quick access to call information, audio source and more. The Civic has received a 5-star safety rating from ASEAN NCAP. Gets lane watch feature from the Honda CR-V. Although Honda India hasn’t revealed the launch date yet, it has confirmed that the all-new Civic will reach its showrooms next month. And today, the company has revealed every detail about the sporty coupe, except for its variants and prices. While my colleagues sample the car in person and take it for a spin to get you our first impressions, let me take you through the details of the 10th generation Honda Civic. As suspected, the India-spec Honda Civic will come with two engine options. While it has retained the 1.8-litre petrol engine from the older model, the Civic has acquired the 1.6-litre diesel from the Honda CR-V. Also, this time around, the manual transmission will only be available with the diesel engine. The petrol motor will be offered with a CVT automatic. The 1.8-litre i-VTEC has been updated to be BSVI compliant, but not with BSIV quality fuel. It still makes the same power and torque as before. The engine produces 141PS of power at 6500rpm and 174Nm of torque at 4300rpm. It comes mated to a 7-step CVT which can be manually controlled via paddle shifters behind the steering wheel. Claimed efficiency for this combination is 16.5kmpl. The diesel engine, on the other hand, is straight out of the Honda CR-V. The 1.6-litre unit makes 120PS of power at 4000rpm and 300Nm of torque at 2000rpm. This engine is paired to a 6-speed manual transmission. What caught our attention is the claimed efficiency figure of 26.8kmpl! 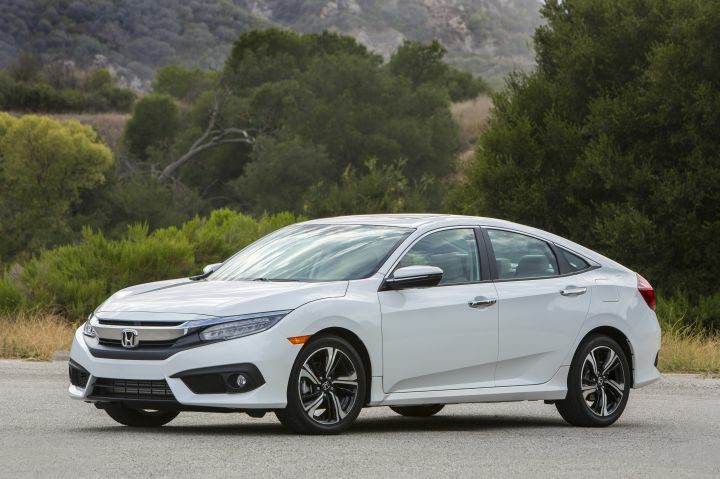 While the variant details are not public yet, we know that the Civic will be available in more than one trim level. In the tech department, the Honda Civic comes with a 7-inch all-digital instrument cluster, a 7-inch touchscreen infotainment system, 8-way power adjustable driver seat, dual-zone climate control, engine remote start and an electric sunroof. It even get different view modes for the rear camera like top, normal and wide rear view. The Civic also packs a hefty safety kit with anti-lock braking system (ABS) and electronic brake distribution, brake assist, automatic brake hold, vehicle stability assist with traction control, lane-watch camera like in the CR-V, hill start assist (HSA), six airbags, and ISOFIX child seat mounts. The Civic even has a 5-star ASEAN NCAP safety rating. The Honda Civic will be available in five colours – Platinum White Pearl, Radiant Red, Modern Steel, Lunar Silver and Golden Brown. The Honda Civic measures 4656mm in length, 1799mm in width and 1433mm in height. The wheelbase of the saloon is 2700mm long and it has a boot space of 430 litres. Also, it gets 215/50 R17 wheels with disc brakes on all four corners. It even gets ground clearance of 170mm (unladen). We will be driving the cars tomorrow and will have a first drive review up by Friday when the embargo lifts. So stay tuned.